Alternative weather provider selection. Under > Mode is the ability to switch weather provider to get a second opinion. Available to Premium Members. Weather Change Icons on long routes are reduced in number to provide better Wind Line visibility. Auto open is also deactivated on longer routes. Crosswind warning Icons on long routes are reduced in number to provide better Wind Line visibility. Fixed distance marker flooding issue on long routes. Strava generated GPX now supports Watts, Speed and Time data. 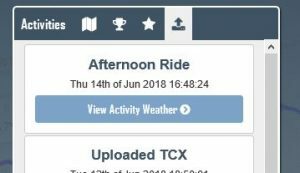 Previously GPX files were not read for ride data and only route was provided. Removed Resolution as a Chart Option as this is handled internally. Access Uploads from the Connect menu. Fixed Virtual Partner problem with Uploaded files. Virtual Partner is no longer a tab in the Options menu as it can be accessed where available from the top bar in forecasts.